It was a sunny, crisp morning. The wind kicked up a bit and the dogs were frisky in the cooler temps. On the way back from our morning walk I spotted five Great Egrets and a couple of Black-crowned Night Heron juvi's roosting in the trees along the pond near our home. Today is the day I get to purge and reorganize my studio to make way for an elliptical. I'm so looking forward to exercising but really not in the mood to go through my ever growing pile of papers. I think I inherited the piling syndrome from my Mom. The art of procrastination.... well, I developed that all by myself! 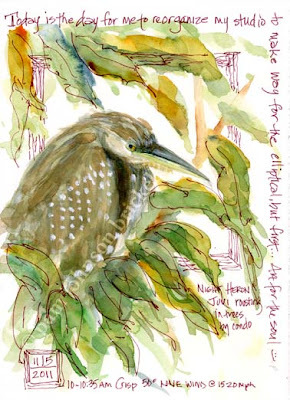 A few minutes later, art bag, bins and chair in tow, I found only a couple of night herons and an Anhinga left in the trees. No matter. Plenty of visual goodies to choose from. Have a great weekend and don't forget to turn your clocks back tonight! There must be something in the air today. I too have been purging and reorganizing my studio and on someone elses blog today I just noticed that they were doing the same thing. it must be the time change. :)) So glad you had time to do this fun drawing. You have so many cool birds around you to choose from. Thanks, Cris! Yes, I pinch myself everyday. I'm in wading bird heaven :) Made lots of progress in the studio. One more area to go and I'm free! I was so surprised the first time I saw a juvie Black-crowned Night heron...they were brown and white! I love your painting of him. He's perfect. (BTW, I'm all too familiar with the art of paper piling...and procrastinating!). Thanks, Kelly! Ahhhh, paper and procrastination... what a duo! I must admit that I am a paper piler as well. You know, out-of-sight is out-of-mind to me. Beautiful sketch though! Glad you have your priorities right, though, girls need all the fun they can get! Glad I'm not alone with paper piles :) The scanner being advertised to end the piles looks good to me but I'm afraid I'd never get that done!